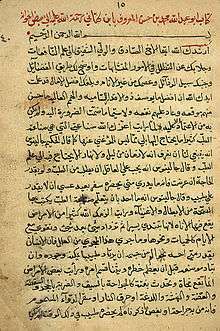 Abu Abd Allah Muhammad ibn al-Husayn Ibn al-Kattani (951–1029), sometimes nicknamed "al-Mutatabbib" (the physician), was a well-known Moorish scholar, philosopher, physician, astrologer, man of letters, and poet. Born in Córdoba in what is now Spain, he wrote books on logic, inference and deduction. For some time he was the personal physician of Al-Mansur Ibn Abi Aamir, sultan of al-Andalus, and wrote The Treatment of Dangerous Diseases Appearing Superficially on the Body (Mu`alajat al-amrad al-khatirah al-badiyah `ala al-badan min kharij). It was cited by later writers, but thought to be now lost, until a copy of it was discovered among the manuscripts now at the National Library of Medicine. Much of the treatise is on the subject of poisonous bites. Al-Kattani also wrote an anthology of Andalusian poetry, and became especially famous by his book on metaphor in Andalusian poetry. He died in Saragossa in 1029. Bosch Vilá, J.: El Oriente Árabe en el desarrollo de la cultura de la Marca Superior; Madrid, 1954. Tomeo Lacrué, M.: Biografía Cientifica de la Universidad de Zaragoza; Zaragoza, 1962. Martínez Loscos, C.: Los orígenes de la Medicina en Aragón, Cuadernos de Historia J. Zurita, n.° 6-7, Zaragoza, 1958.